Here’s a special post for those of you who, as I do, live in places facing record-breaking windchill temperatures this week. All of us wait anxiously to learn which activities are moving forward and which are cancelled due to snow. And, of course, everyone listens for school snow days. This week some clever administrators from Swartz Creek, Michigan took it to the next level. Take a listen. I know some schools plan online snow day activities for students to pursue. 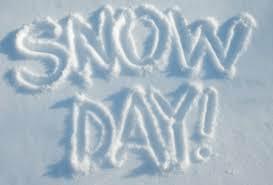 If you are looking for snow day assignments–or if you anticipate snow days in your future–wouldn’t it be a great creative challenge to have students put together their own creative snow day announcements? Perhaps you could get your school to use them. And if you live in warm places without the delightful option for snow days, send your announcements up to Michigan. I have a feeling we can use them!